The Oscar is undoubtedly a species of fish worthy of a place in any aquarium, as long as its large enough, in any home. They are attractive, intelligent, fairly easy to keep, and certainly entertaining to watch. They also have a fabulous lifespan, often living for up to twenty years, and grow to a massive 12 inches long and sometimes even bigger! A graceful swimmer that has often been known to respond to their keepers by wagging their tails and shaking their heads at the sight of them, the Oscar really is a delight. However, this kind of behavior can be a little deceiving as they are certainly not all sugar and spice. The Oscar also has an aggressive streak that it shows when sharing its aquarium. It would be fair to say that the Oscar is not the best at making friends with other fish, but nor is it the worst. Rather, it is somewhere in the middle and requires some care being taken when it comes to choosing tank mates. Ideal tank mates for the Oscar will be firstly large enough that they will not fit in their mouths to be eaten. And secondly, passive enough to stay out of the Oscars way whilst being aggressive enough to defend themselves if need be. Oscar Fish will grow to over 12-14” and need a large tank. Keep them well fed, and provide some big rocks and caves with plenty of water volume and a good size aquarium and you’ll have no issues finding suitable tank mates for Tiger Oscars. If you’re wondering what we fed our Oscars,we used Aqueon Jumbo Cichlid pellets which are a perfect size for 6-7″ Plus Oscars. If you’re are smaller then you’ll need the same product but choose the smaller or medium size pellets. At approximately 18 inches in length, the Sailfin Plecostomus is a real giant of the aquarium and perfectly capable of holding its own with the Oscar. This, however, is rarely needed though, partly due to the bottom-dwelling nature of the Sailfin Pleco, and also its inactivity. Plecos, in general, spend most of their time laying in one position, often behind driftwood or in caves. Should it need to defend itself against the Oscar it has, amongst it armory, a sharp and spiny dorsal fin capable of causing injury. Sailfin Plecos are all different shades of brown with lighter patterned markings. 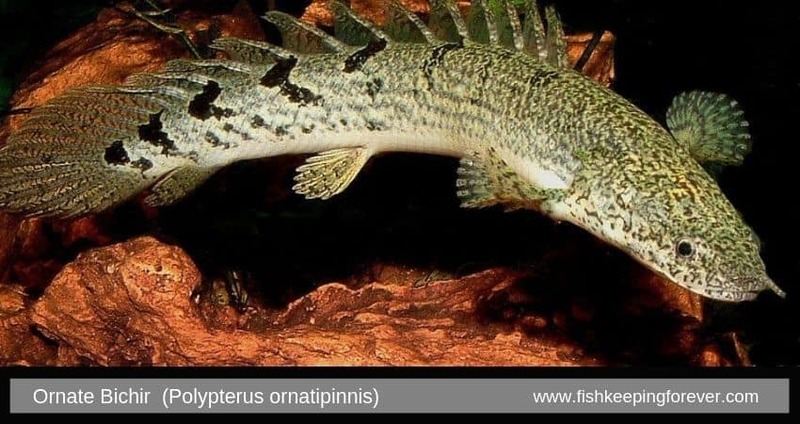 Considered the most attractive of the Bichir group, the Ornate has a silver belly with black and light gold mottling and stripes. All of this is crowned with a spiny dorsal fin that runs right down its back and makes quite the formidable defensive weapon. They can reach an incredible length of up to 24 inches, twice the size of an Oscar. Ornate Bichirs are considered an oddball of the aquarium and do best in densely planted aquariums with plenty of places to hide. 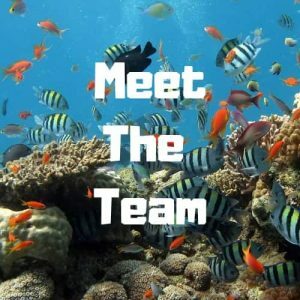 Like the Sailfin Pleco they tend to keep to themselves at the bottom of an aquarium, but are also known for fairly speedy swimming to the surface and back down. 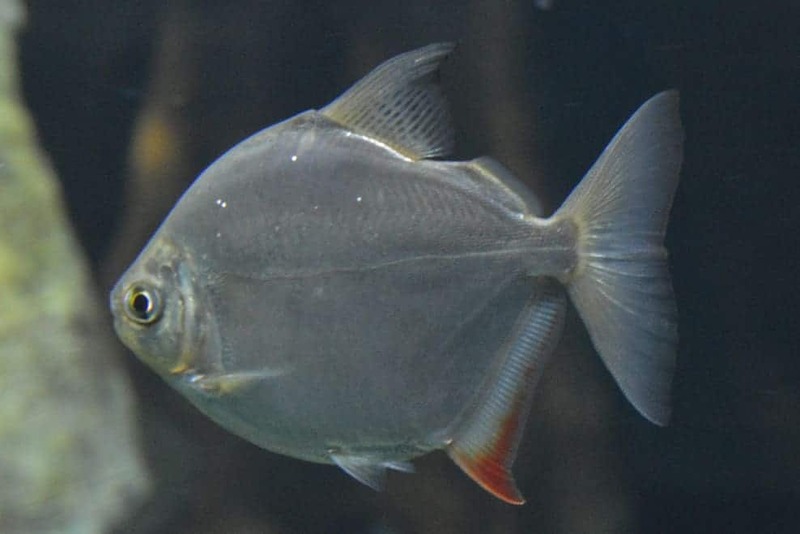 Named for their round shape and silver coloration that resembles, yes you guessed it, a silver dollar, this fish is one of the smallest on our list. It still, however, is too big for the Oscar to eat at around a maximum of 6 inches. Silver Dollars are best kept in groups of three and more and need plenty of rocks, plants, and driftwood to hide in. They are a lively and schooling fish that will swim speedily away from the Oscars possible wrath. 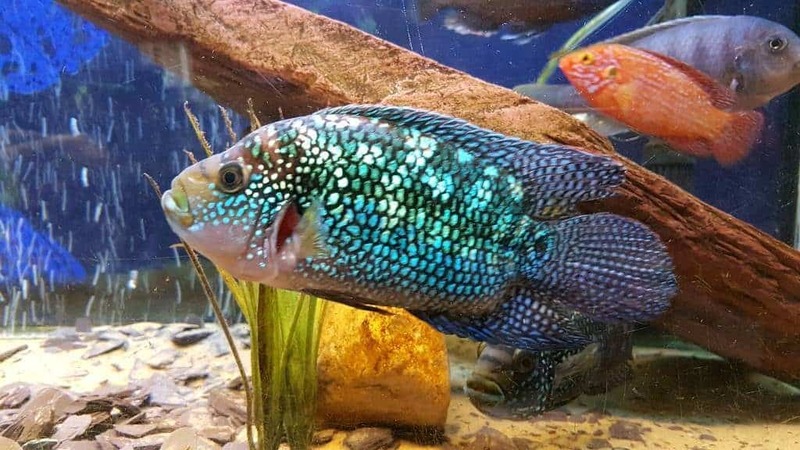 An incredibly popular fish the Jack Dempsey has a dark brown to gray coloration with many blue and green iridescent spots. They are hugely attractive and of an impressive size, reaching a maximum of around 10 inches. It needs to be noted, however, that the Jack Dempsey like the Oscar, will eat any fish that are smaller than them. They are also the most aggressive recommended tank mate on this list and require an aquarium that has been divided up. This is necessary as Jack Dempseys like to establish a territory. The Gold Severum is as perfect a companion as you could possibly get for the Oscar. This is because they will definitely stand up for themselves, are capable of competing for food, and also have a friendly side. Gold Severums, like Oscars, are often found to accept food from their keeper’s hand. Looks wise the Gold Severum is tan to yellow in color and grows to a maximum of eight inches. They look kind of cute to the Oscars grumpy appearance, making a fabulous contrasting look. Like the Ornate Bichir, the Jurupari Earth Eater is a bit of an aquarium oddball. They are a long and slender peaceful fish with a rather large odd-looking mouth. This strange looking mouth, however, comes with the ability to scoop up plenty of sand, which is lucky since they spend most of their time doing this in search of food. Jurupari Earth Eaters can reach up to 10 inches in length and like to be kept in groups. Like the Ornate Bichir and Sailfin Pleco, they are mainly a bottom-dwelling species and will not bother, nor be bothered by the Oscar. A good looking electric blue fish the Blue Acara is a smallish chap at around 8 inches but one that can stand their ground. They are fairly aggressive and can compete well for food making them an excellent Oscar companion. It should be noted that as a juvenile they will struggle to cope with the rigors of an Oscar, especially at feeding time. For this reason, it is better to add, where possible, adult Blue Acaras to an Oscar aquarium. 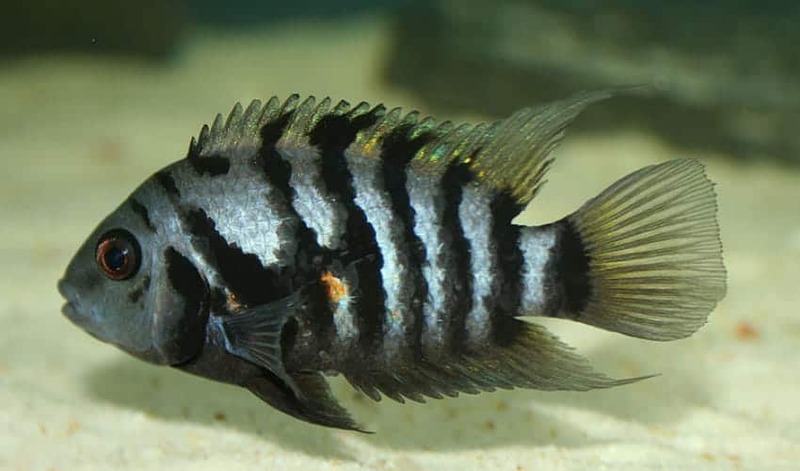 The Black Banded Leporinus may seem an usual choice for an Oscar tank mate since they can be timid and skittish at times. However, they are also very good at keeping themselves to themselves and avoiding trouble. They can occasionally nip at other fish’s fins but this is nothing, when in with an Oscar, to be worried about. The Black Banded Leporinus is a stunning looking black and yellow to gold striped fish that can reach up to 12 inches in length. They have an elongated shape, rather like that of the red tail or rainbow shark, and spend a lot of time near the bottom. Like the Silver Dollar, the Black Convict Cichlid only has a maximum size of 6 inches. What they lack in size, however, they make up for in feistiness. 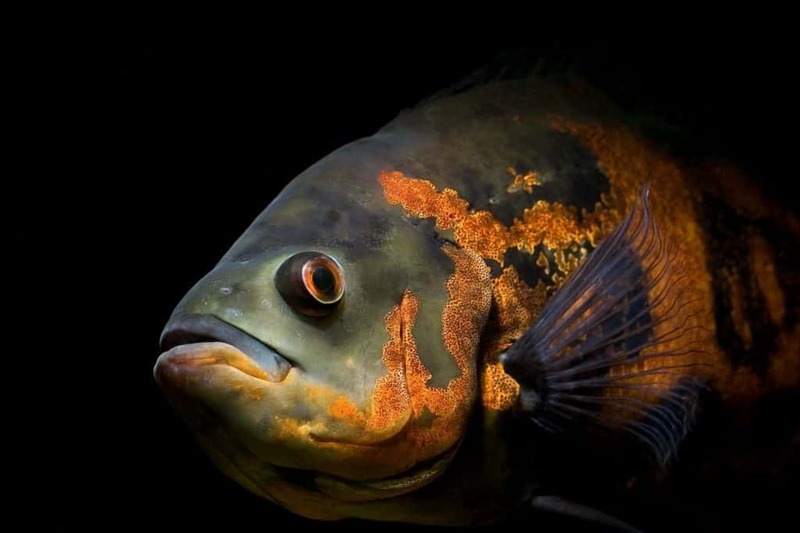 The Black Convict Cichlid is definitely capable of holding its own against the Oscar. They also have speed on their side and can quicky escape a Tiger Oscar attack behind rocks and caves. Just make sure the rocks are big enough that the Oscar cannot move them. You’ll be suprissed how strong an Oscar fish is! The Black Convict Cichlid has a gray body with black stripes, and a greenish tint on the fins. As they age, the male of the species will develop a fatty lump on the forehead. Juvenile Tiger Oscars can live in a 50-75 gallon tank but will need more space as they grow. Conclusion: Which fish can live with Tiger Oscars? If you’re just thinking about buying an Oscar Fish then you simply have to read our Complete Tiger Oscar Guide. This has all the basic information you’ll need to know including cost of keeping one, breeding, size, diet and lots more helpful information. Although Tiger Oscars can be very powerful and sometimes aggressive fish they normally live happily with many species of fish as long as they have rocks and caves to escape to if your Oscar decides to go on the attack. Any hardy species above over 3-4” with suitable rocks and Caves will be fine with Oscars. I had my pair in a 150 Gallon tank for many years and had many different species share their space without issues. Oscars have a huge lifespan and can live up to 20 Years. They are a longterm choice and you’ll need to plan for the future buying one of these fish. You’re in for the long ride with these fish. 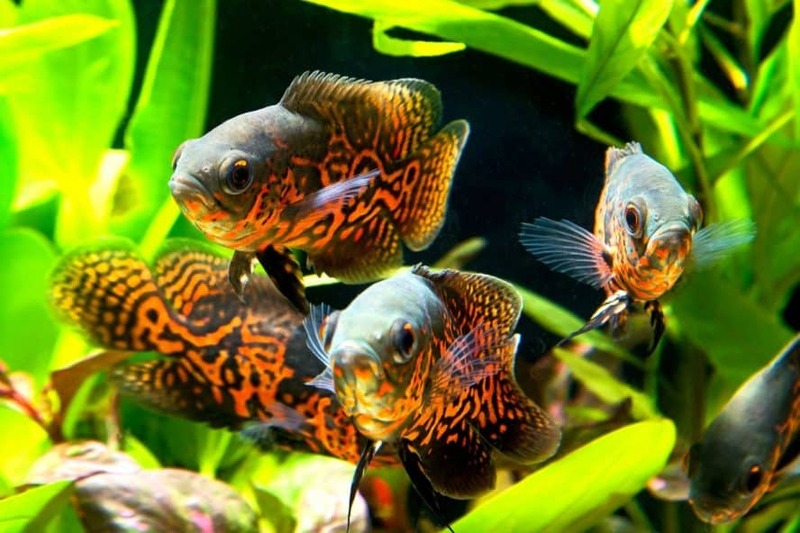 I kept mine well fed and they grow fast and because I had a suitable size aquarium ( Read what size tanks are best for Oscars here ) with plenty of big rocks and caves I had no fish fatalities due to the Tiger Oscars themselves.